Set in private gardens above Portpatrick, Fernhill Hotel boasts open views over the village, harbour and Irish Sea. This family-run property features a bar, a restaurant, free Wi-Fi and free private parking. 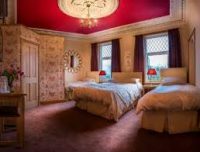 The rooms at Fernhill Hotel come with tea and coffee making facilities and all have a private bathroom with bathtub or shower. Guests can have dinner at the hotel’s restaurant or relax with a drink at the bar. Room service is available, breakfast can be served in the rooms and packed lunches can also be arranged upon request. This property is 5 minutes walk from the beach. Rickwood House is set in Portpatrick, 5.6 miles from Stranraer. Free WiFi is offered throughout the property and free private parking is available on site. Each room has a flat-screen TV. Certain rooms include a seating area where you can relax. You will find a kettle in the room. 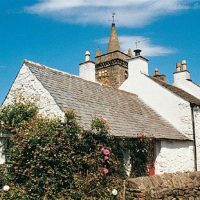 Kirklauchline Holiday Cottage is a fully refurbished traditional Galloway Crofters Cottage providing spacious, stylish holiday accommodation for couples, families or friends. Dogs are welcome (2) at no additional cost. 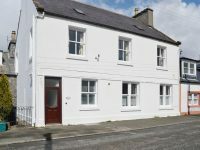 Located 3.5 miles from the pretty harbour village of Portpatrick in a rural location with sea views across rolling farmland and the irish sea with the coast of Ireland beyond. Spectacular views across the sea to Ireland and the mountains of Mourne and to the south the Isle of Man and the South Rhins coastline. This is a truly ‘get away from it all’ holiday resting-place. 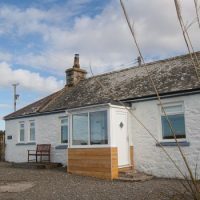 An enclosed garden makes Kirklauchline Cottage a great destination for families and pet owners and our decking area is the perfect place to sit and relax and take in the views. We have a large open plan living and dining area with comfortable furnishings, oak floor and two log burners. For your entertainment we have WIFI, TV, DVD and CD and ipod dock together with books, games and tourist information. 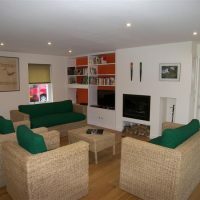 Kirklauchline Cottage is centrally heated with instant hot water. Our fully fitted kitchen provides “home from home” cooking facilities with electric fan oven, electric hob, microwave, fridge freezer, dishwasher, kettle and toaster.. A starter supply of tea, coffee and sugar is provided as well as fresh milk in the fridge and a welcome basket full of tasty treats (there is even a treat for the dog). We have a modern bathroom with fitted furniture and a bath with shower over. Two comfortable bedrooms with hotel quality bed linen, towels and dressing gowns for adult guests. The Scottish Fine Soaps toletries are provided as an added holiday treat. 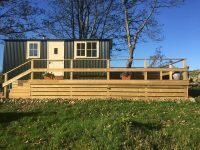 The double bedroom looks out across the decking towards the sea whilst the twin room overlooks the surrounding farm and heathland. 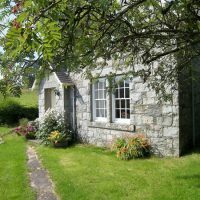 Pets are welcome at Kirklauchline Cottage (maximum 2 dogs) at a small extra charge. 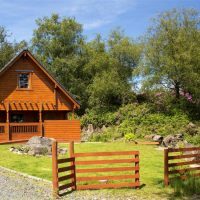 Ar-Tigh Bothy is a delightful cosy holiday cottage with full disabled access and facilities. 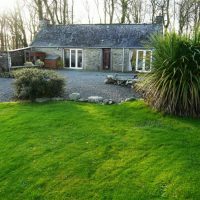 The cottage complete with underfloor heating has superb views over the rolling Galloway countryside and, with good visibility, of the Mountains of Mourne in Ireland together with the Isle of Man. 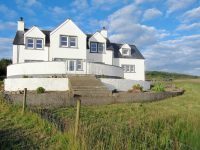 It is superbly located for exploring South West Scotland and is within easy reach of the popular seaside town of Portpatrick approximately 2km away. Portpatrick is one of the loveliest coastal villages in this region with a charming old fishing harbour, lifeboat station, promenade, putting, tennis, golf, bowling, cliff walks, beach, local shops & good pub food. The local area has superb opportunities for exploring and outdoor pursuits. There are plentiful deserted sandy beaches together with attractions such as Logan Botanical Gardens, Mull of Galloway Lighthouse and Dunskey Gardens with its famous maze. Golf courses abound and the Portpatrick course is almost within walking distance. 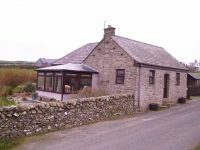 Whether you are looking for a strenuous outdoor holiday or just to enjoy the local wildlife the Bothy makes a superb holiday base. 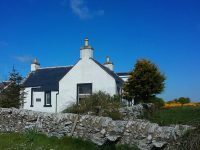 Welcome to Knockinaam House, a beautiful detached holiday cottage nestled in Knockinaam Wood just 5 minutes’ drive from the bustling and picturesque fishing village of Portpatrick. Enjoy the freedom and privacy of this beautiful house, with views to die for. On a fine day open the patio doors from the dining room and eat al-fresco, watching the world go by. Whether it’s an action packed holiday or a relaxing break you are after, this beautiful corner of south west Scotland has it all. Glorious beaches, gorgeous scenery and a lovely climate – the Gulf Stream makes for a mild climate all year round. Visit the Mull of Galloway, Scotland’s most southerly point, home and the location of an RSPB reserve with a great variety of species including guillemots, kittiwakes and puffins. Try the circular walk round the cliff top to see if you can spot pods of porpoises in the bay. There are no fewer than five stunning gardens to visit including Logan Botanic Gardens and Castle Kennedy Gardens. The Galloway Forest offers exceptional walking and cycling, including the world famous 7Stanes cycle trail. It is also a designated Dark Sky Park. 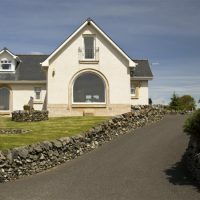 There are several golf courses within easy reach of Knockinaam House including Portpatrick and Wigtownshire County, an 18-hole true links course. You could spend a lifetime exploring the many lovely walks in the area from clifftop paths to forest trails. 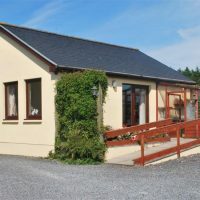 Return to Knockinaam House after a long day and relax in front of the open fire in the cosy living room or sit on the terrace enjoying the beautiful dark skies. Beach 1 mile. Shop, pub and restaurant 4 miles. 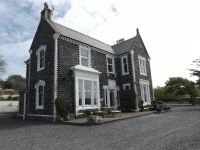 Knockniemoak Bed and Breakfast is located in Knockniemoak, a 10-minute drive from Portpatrick. Free WiFi access and parking is available. Each bedroom offers an en suite bathroom, which also comes with complimentary toiletries. The rooms offer a TV with cable channels, and tea/coffee making facilities. The bedrooms boast views over the countryside. At Knockniemoak Bed and Breakfast you will find a garden. Other facilities offered at the property include a shared lounge and a sun terrace. Guests are able to enjoy a cooked breakfast in the morning, with vegetarian options available. 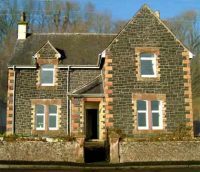 Braefield House offers a high standard of self-catering accommodation for up to 15 people in the picturesque harbour village of Portpatrick on the south-west coast of Scotland. All rooms have flatscreen TVs and Braefield House is pet-friendly. Ideally situated on Stranraer seafront, overlooking Loch Ryan and just 5 minutes’ walk from the town centre and train station, this family-run guest house offers free Wi-Fi, ample, free, off-street parking, scenic views and cooked breakfasts. Cairnryan ferry terminal is only a 5-minute drive. Delicious full Scottish breakfasts are served daily in the dining room at Lakeview, and continental options are also available. Special diets and early breakfasts can also be arranged. The property offers a snack menu, which is served in the dining room and includes homemade soups and toasties. The guest house is just 5 minutes’ walk from a selection of shops and restaurants. The shores of Loch Ryan are just metres away, and Stranraer Golf Club is a 5-minute drive away. 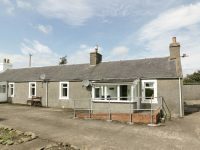 This end-terrace cottage is located near the town of Stranraer, surrounded by far reaching countryside and farmland. Ideal for couples this retreat makes a charming holiday any time of the year. Wander inside to the light and airy sun room where you can relax in the day time when the sun is out and admire the garden ahead of you. For a cosy evening the dining room is home to a wood burner, stone features, so you can be at one with the soothing ambience all night long. A dining table rests to the side, perfect for enjoying those home cooked meals without having to leave the heart warming layout. A double bedroom is neatly presented, with attractive wall pictures, and comes complete with oak furnishings that bring a sense of character to the room. To the other side, a kitchen is well equipped with all the appliances and essentials you will need, so you can feel right at home upon arrival. Just around the corner, a family bathroom is ideal for getting ready ahead of your day, hosting quality fittings. Outside of the cottage, the south facing garden is perfect for enjoying a glass of something refreshing, while sitting on the benches and looking out over the far reaching fields that lie in the distance. 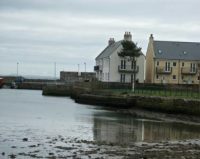 With more to see, the town of Stranraer is close to many shops and cafes, along with beaches; whilst the Stranraer Town Trail takes you into the depths of the fascinating history and beyond. Three nearby gardens are open to the public and well worth a visit – at Castle Kennedy, Glenwhan and Logan. A short drive south and you come to the Mull of Galloway, Scotland?s southernmost point. However you choose to spend your holiday, this is a lovely retreat all round. Beautifully refurbished to a very high standard, this luxury self-catering listed property retains many original historic features alongside modern conveniences. 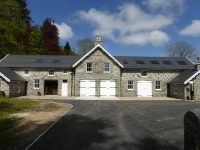 Once home to the Stair family chauffeur, the apartment has three large airy bedrooms, an open-plan living area with an open log fire, central heating, a well equipped kitchen with laundry facilities, drying room, bathroom/shower room and additional cloakroom, flat screen TV, wi–fi and private car parking. This is the perfect place to relax and unwind. The Apartment has stunning views overlooking the Victorian Stable Courtyard, the White Loch and the turreted Lochinch Castle. It offers a secluded, private garden area to the rear, perfect for summer barbeques. Guests are able to enjoy unlimited access to Castle Kennedy Gardens and the surrounding Lochinch Castle Country Estate, with all that these offer through-out the different seasons. A welcome pack is provided for guests on arrival including milk, bread, jam, butter, tea, coffee and fresh flowers from the garden (when in season). The cottage is well equipped with the general basics from washing-up liquid to bin bags and loo roll. Luxury bed linen and towels are also provided (The White Company). 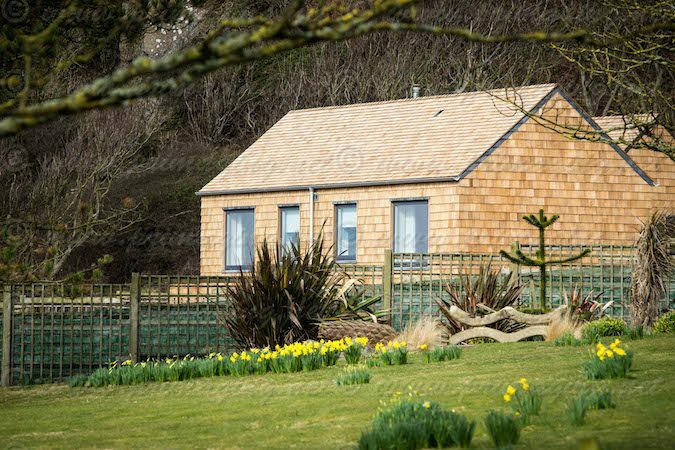 Pretty East Lodge is a perfect romantic getaway set on a private country estate with stunning views across tranquil Luce Bay to the front and woodland to the rear. 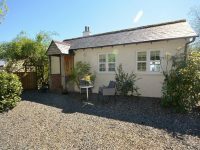 The former gatehouse of the 18th century Ardwell House on the Ardwell Estate is a listed building which has been lovingly converted into an attractive, one-bedroomed cottage. Guests can enjoy free access to the Estate grounds — a popular visitor attraction due to its range of exotic flora, walled garden, ponds and enchanting woodland walks. Keen anglers also have the opportunity to fish in the Estate’s loch, which is well stocked with good-sized rainbow trout. The Lodge has a small modern fitted kitchen, a lounge/dining area with open log fire (wood provided), a double bedroom and a bathroom with bath and shower. We have recently installed central heating for instant heat but most guests enjoy the open fire and we keep the cottage well stocked with coal, wood from the surrounding estate — and firefighters. In some circumstances we can arrange for it to be lit an hour before you expect to arrive. To the rear is an enclosed south-facing garden with wooden decking and garden furniture perfect for sitting out and enjoying the views. The grounds of the former 18th century Balkail Mansion are the perfect backdrop for Glenluce Holiday Park. Tucked away in the heart of Glenluce Village, the Park sits in harmony with the mature woodland setting on the banks of a tributary to the River Luce. Glenluce Holiday park also offers award-winning holiday homes for hire and, with the luxury of an indoor swimming pool, it is the perfect choice for one and all to visit. Only a couple of minutes away from the charming village of Glenluce, Whitecairn Holiday Park nestles comfortably on the hillside overlooking the sparkling waters of Luce Bay. The Park, which is ideal for families or couples, offers an exceptional range of luxurious holiday homes for hire. 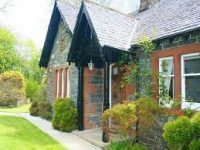 Glen Auchie is a traditional Galloway cottage now fully refurbished to a high standard. 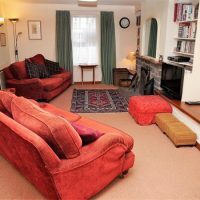 We have a cosy living room with modern comfortable furnishings and an electric log effect burner. The living room leads through to a beautiful conservatory with coastal views which has a cosy wood burning stove; logs included in price. Our well-equipped holiday home kitchen with electric cooker, microwave, fridge (with separate freezer) with a family dining area has everything you need for a perfect self-catering holiday. There’s also free Wifi should you need it. The spacious double bedroom is comfortable and cosy and the second bedroom has a single bed with additional pull out guest bed. All bedlinen and towels are provided. Our porch is ideal for walking boots and coats and we have secure outdoor storage for bicycles, walking gear or fishing gear. We also provide secure private parking. Glen Auchie hall, sitting room and back porch are tiled making it easier for you and pets after you have been away long walks over fields and to the beaches. A self-catering holiday at it’s best! 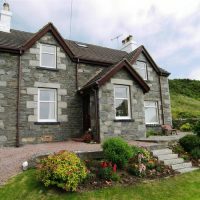 East Muntloch Croft is a cosy, friendly bed and breakfast at the Mull of Galloway. Each en suite room has a TV, Radio, CD Player, tea/coffee making facilities & biscuits and free WiFi access. Breakfast is included in the room rate, and can be served at a time to suit guests. Local beaches can be found within a short walk, and Drunmore is 2 miles from the property. The Mull of Galloway Lighthouse is 3 miles away and Prestwick Airport is 2 hours’ drive away.